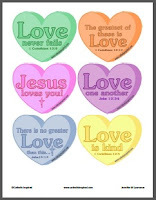 These hearts are great for many things! We used them to decorate our "St Valentine's Day Tree". Plus, they were fun for sticking all over the house or classroom to help brighten it up during dark winter days. 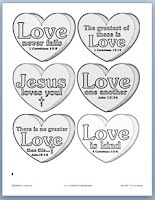 They would also be great for homemade Valentines and St. Valentine's day crafts! They would make great labels for gifts too! They could be cute cupcake toppers, as well!! These are available for free in our Download Shop.